When you think of a healthy diet, you probably imagine one packed with fresh fruit. That might be a winner for us, but it’s not quite the same for our dogs. So can dogs eat fruit? Well, fruit isn’t off the menu altogether – packed with vitamins, antioxidants and fibre, it can be a great snack option for our four-legged friends. But it’s also high in sugar, moderation is key for long term weight control. Plus, some fruits can upset your dog’s digestive system – or worse – so it’s important to know your stuff before you stock up the fruit bowl. Can dogs eat apples? You bet. High in fibre and low in fat, apples make a delicious doggy snack. Only serve the skin and flesh though, as apple pips contain traces of cyanide, a substance that’s toxic to dogs (and humans – but we’re big enough to tolerate the amount in an apple pip or two). Rich in potassium and carbohydrates, bananas bring a lot to the nutrition table. But they also contain high levels of sugar so serve sparingly, or incorporate them into a dog-friendly recipe. High in vitamins C, E and K, and packed with antioxidants like anthocyanin, berries are great nutritional all-rounders. Blueberries contain good levels of B vitamins like folate and B6 too, while blackberries are a great source of potassium and magnesium. Meanwhile, raspberries are sweet, without being too calorific – great for dogs on a weight management diet. These Wimbledon favourites are full of health-boosting antioxidants. But strawberries are also higher in sugar than other berries, so it’s important to serve them in small amounts. Fresh and frozen are the same nutritionally, so see what your dog prefers. Full of vitamin C, and packed with fibre, pears are another safe snack option. But as with apples, it’s important to remove the cyanide-carrying pips before putting a pear anywhere near your dog’s bowl. Tomatoes are refreshing and full of vitamins, and are safe to serve in moderation. But it’s important to wait until they’re fully ripe, as tomatoes contain low levels of solanine, a poisonous compound which can affect the digestive and nervous system. The levels of toxin decline as the fruit ripens. These squishy summer fruits are fine to give your dog, but the stone is poisonous, so never serve them whole. All three are bursting with antioxidants – like chlorogenic acid – and are rich in vitamins C,E,K, as well as B vitamins and potassium. 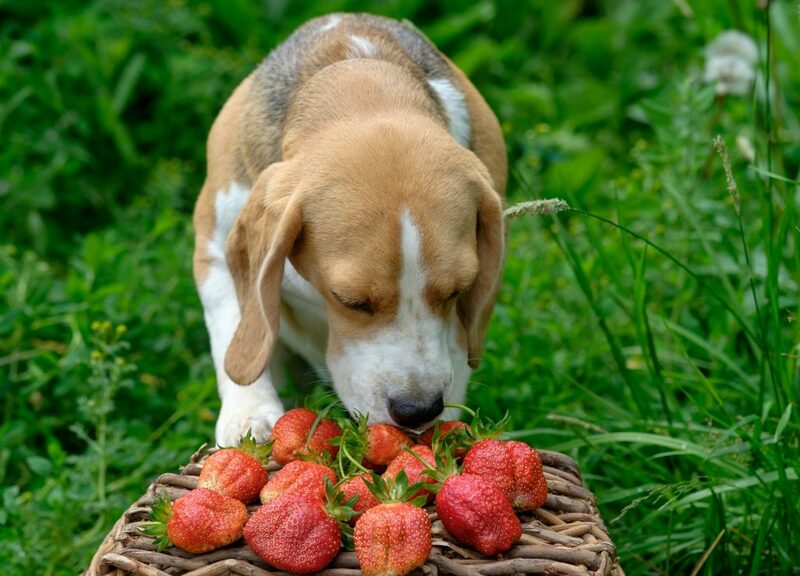 Which fruits are harmful to dogs? Oranges, lemons, limes and grapefruit are all worth avoiding. That’s because they contain citric acid and essential oils that can play havoc with your dog’s digestive system. These sour fruits can give some dogs a nasty digestive reaction. Stick to safer berry options – like blueberries – instead. Nobody knows quite why these fruits are so dangerous for dogs – the leading theory is that they can contain traces of a mould that’s toxic to dogs. Whatever the cause, they’ve been linked to symptoms as severe as kidney failure, so they’re definitely best avoided. When fruit is dried, the sugars get concentrated – that makes dried fruits like dates, figs and apricots too high in sugar for dogs. The fresh versions are mostly OK, except grapes, which are harmful to dogs however they’re prepared. While some berries are nutrient-packed and safe for dogs, a lot of the ones you’ll see on your summer walks are far less friendly. Rowan, holly, juniper and elderberries are all harmful or poisonous, so if you see your dog making a beeline for a berry-dotted hedge, intervene. How can I introduce fruit into my dog’s diet? Before giving a new fruit to your four-legged friend, it’s a good idea to double-check it’s on the list of foods dogs can eat. There are lots of exceptions and serving points to remember so even if you think you know, it’s always worth another look. Only let your dog eat fruit that’s fresh – mouldy fruit is as bad for dogs as it is for us. If you have fruit trees, keep your dog away at harvest time so they don’t accidentally eat any spoilt or infested fruit that’s fallen on the ground. Thoroughly wash or remove the peel from any fruit you’ll be giving your dog – just as you would if you were eating it yourself. Even if a food is safe to give your dog, serving a bowlful straight away can lead to an upset stomach. To avoid any unpleasant reactions, give your dog a small piece to try, then increase to a snack-size amount over time. Fruit can be good for your dog in small quantities, but serving too much can have the opposite effect. Be especially careful with high-sugar fruits like strawberries and bananas. Got a question about serving fruit to your dog? Unsure what dogs can eat safely? Our vet and nutritionist team knows their apples from their oranges, and are always happy to help. Get in touch at hello@tails.com. Hi, I have taken you up on your free offer of dog kibble, could I ask do you use anything in your foods to prevent tear stains as Burns do? If you do how do I change my order to have this included in my girls kibble? Can you send an email to hello@tails.com so that our Customer Experience team can help answer your question. Thank you so much for this article! I already tried to feed my Happy fruits several times, but unfortunately he just does not seem to like them. Maybe it were the wrong fruits… I will definitely try introducing it like you recommended above! My dog Douglas eats blackberries, starting from now until they run out. He also eats baby plums, stone and all. The stones appear after a while though. He. Any get enough of them so I have to put him on a lead when we walk that way!! My dog loves oranges although I have just read they are not good for dogs. She is able to smell them from a great distance and really enjoys a small amount when she has been off her food which obviously seems such an anomilie. My girls, I’ve just discovered, also like cucumber. My neighbour drops them in from his allotment and they thought they weren’t missing out, so I chopped a piece for each, expecting their noses to turn up but both really liked it !! I have two pet dogs. I Spent a lot of time to take care of them. I am always researching about dog foods for their good health. My dog eat pears and some other fruits but he like to eat Pears. Thanks for the article and keep posting on this topic.